Though the Church makes but a simple commemoration of this illustrious Virgin in the office of this day, we will not fail to offer her the homage of our devout veneration. On the twelfth of this month, we kept the feast of the noble Virgin and Martyr, Flavia Domitilla; it is probable that Aurelia Petronilla was also of the imperial family of the Flavians. 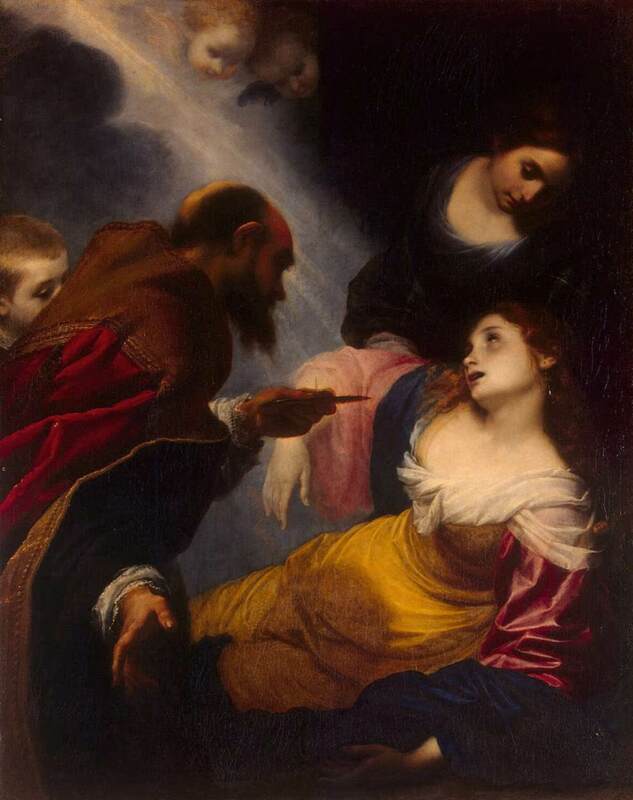 The early traditions of the Church speak of her as being the spiritual daughter of the Prince of the Apostles; and though she did not, like Domitilla, lay down her life for the Faith, yet she offered to Jesus that next richest gift—her Virginity. The same venerable authorities tell us, also, that a Roman Patrician, by name Flaccus, having asked her in marriage, she requested three days for consideration, during which she confidently besought the aid of her Divine Spouse. Flaccus presented himself on the third day, but found the palace in mourning, and her family busy in preparing the funeral obsequies of the young Virgin, who had taken her flight to heaven, as a dove that is startled by an intruder’s approach. In the 8th Century, the holy Pope Paul the First had the body of Petronilla taken from the Cemetery of Domitilla, on the Ardeatine Way. Her relics were found in a marble sarcophagus, the lid of which was adorned, at each corner, with a dolphin. The Pope had them enshrined in a little Church, which he built near the south side of the Vatican Basilica. This Church was destroyed in the 16th Century, in consequence of the alterations needed for the building of the new Basilica of Saint Peter; and the Relics of St. Petronilla were translated to one of its Altars on the west side. It was but just that she should await her glorious Resurrection under the shadow of the great Apostle who had initiated her in the Faith and prepared her for her eternal nuptials for the Lamb. Thy triumph, O Petronilla, is one of our Easter joys! We lovingly venerate thy blessed memory. Thou disdainedst the pleasures and honors of the world, and thy virginal name is one of the first on the list of the Church of Rome, which was thy mother. Aid her, now, by thy prayers. Protect those who seek thine intercession, and teach us how to celebrate, with holy enthusiasm, the Solemnities that are soon to gladden us.